At the Leslieville Flea, despite a rainy start, the sun and the community came out in support of the neighbourhood's inaugural flea market, which took place behind The Duke at Queen and Leslie. The market takes place on the third Sunday of every month. 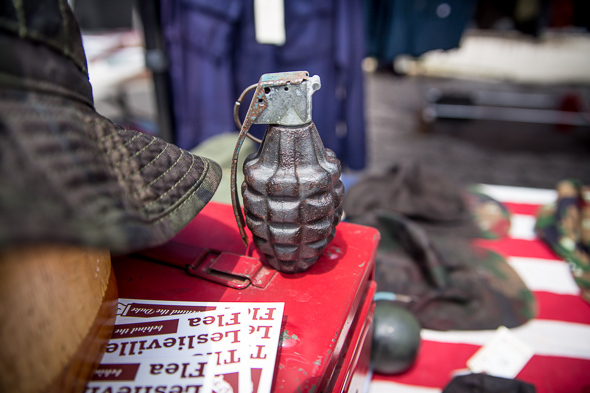 Twenty three vendors offered an eclectic range of items - from antiques to vintage and salvaged items, art, hand-crafted designs and clothing. 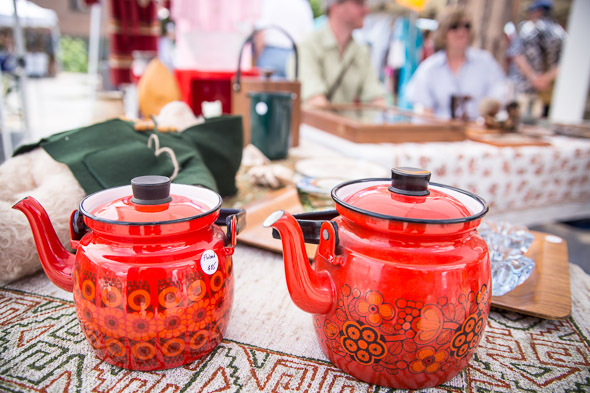 In an age where websites like Etsy are a staple for art, crafts and vintage finds, a flea market is the perfect way to bring out the community, says co-founder Christine Roberts. "It embodies everything that the city is. 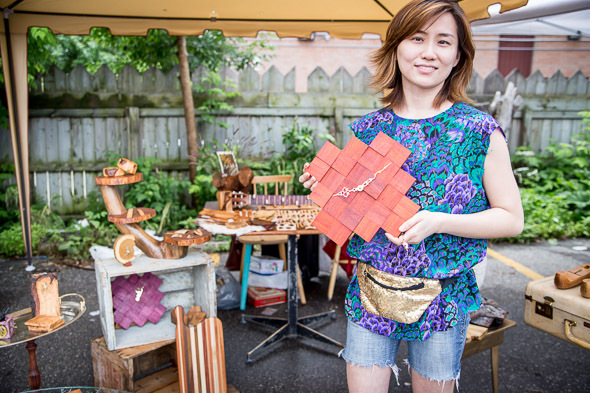 Toronto is a mix of cultures, of people and there is something for everyone in the Flea." As the Flea grows, Roberts says they will be selective in how they curate the show. "We're looking for originality and we don't want too many people who sell the same kind of things." Below is a list of eight vendors who caught my eye at the inaugural event. Nothing satisfies antique lovers more than reworking salvaged building material into a new item of beauty and function - or better yet, buying already re-imagined pieces. Items on sale included windows converted into chalkboards and an airplane food storage case waiting for a visionary to reinvent it. Designer Brian Tuan Vu offers a collection of authentic military clothing that he has acquired, reworked and dyed by hand. Jackets, pants, shirts, tees, and other items are grounded in military roots but re-imagined for an urban setting and sensibility. 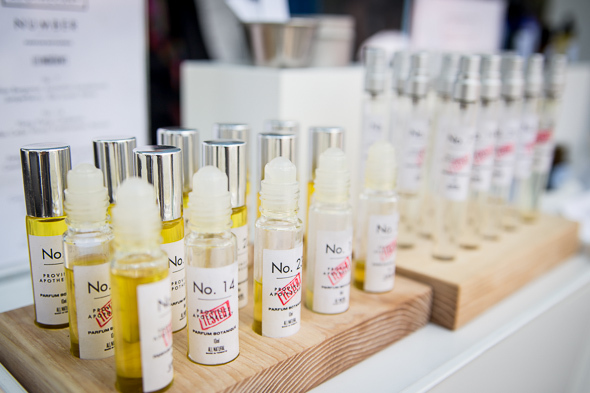 Looking for aromatherapy? Founder and certified Holistic Health Practitioner Julie Clark offers an array of natural skin care products - from essential oils to herbs. She says that as her knowledge developed, she was able to create products that can help clear eczema and improved skin allergies and asthma. Beaches resident and artist Jenna Westphal celebrates her local community through her photography, oil paintings and mixed media art. The petite pieces on display were timely for the summer and perfect for any setting, as you yearn for the outdoors. 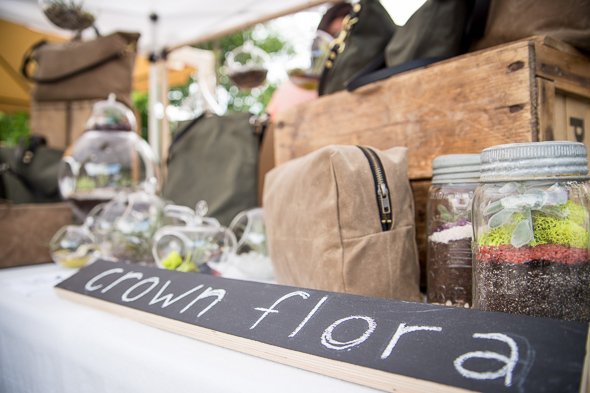 Handmade bags and mason jar terrariums - miniature landscapes with living plants, such as air plants and succulents - sound like an unusual juxtaposition, but it works in a charming and minimalist way. The recently-opened Parkdale-based store continues to delight with its marriage of textile and nature. This certified vintage shop is inspired by and dedicated to exploring Scandinavian and North American modernist design. Many of their selectively hand-picked shop items - which include jewelry, furniture and other home items, and vintage clothing - were on sale at the Flea. Furniture designer Jennifer Rong has channeled her love for wood and junk into art and design, creating a line of furniture, home decor and even jewelry - all based on wood. Items on display included a beautiful oval coffee table, earrings and necklaces, and a custom-made wooden clock. There was even something at the Flea for those looking for baby gifts. Owner and designer Lisa Edgar has turned a hobby of creating gifts for her friends' baby showers into a charming business - offering hand-made onesies and other clothing, blankets, quilts, pillows, and even custom art for kids.